Fishing in Vansjø lake is good for catching fish like perch, pike and more. It`s also good opportunities for fishing in the Oslofjord at the peninsula Jeløya. Photo. Fishing in Vansjo lake, Vansjø in Moss, Norway. With a coastline of over 20 mil is Vansjø one of the largest lakes Norway. Vansjø united all the municipalities in the region. The Vansjø landscape is full of fjords, islands, islets and inlets, which are wonderful for outdoor recreation and nature experiences. 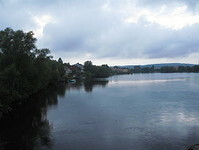 Vansjø is the largest lake in the county Østfold with an area of 36.9 km² and an estimated coastline of about 250 km. Etymologically the name likely derives from "Varna sjor", the ancient name of the district of Rygge. An abundance of bird life can be observed at Vansjø. Swans, grey herons, many different types of duck and a few rare wading birds, as well as ospreys, can be found here. A number of nature reserves have been set up to protect the abundant bird life. In the Vansjø lake there are 16 types of fish; perch, zander, pike and eel are the most plentiful. The best way to experience the diversity and beauty of nature on Lake Vansjø is by boat. The lake is particularly suitable for canoeing and kayaking. Read the story about a local fisherman (see the photo of the big caught) in Moss who won the traditional sport fishing competition on Saturday 10th May 2014. He was standing on the small island Gullholmen just outside the peninsula Jeløya, Moss in Norway, using a pole and with fly on the hook. It didn`t take long time before he could drag ashore a 3.8 kilo polock fish (sei, lyr). At Gullholmen there is a lighthouse called Gullholmen fyr. It was established in 1894, and replaced by a light in 1984. Other great places for fishing in the Oslo fjord around Jeløya are: Verlebukta, Reierbukta, Alby, Breidbukta and Kjellandsvikbukta. You find also good places along the coastline by Refsnes and Nes Camping. You can fish in almost untouched nature at the bay Reierbukta. It`s shallow far out in the water and fishermen need waders to reach out to the fish. Especially fishing trout is popular. You can get fishing permit from Vansjø Grunneierlag club, who sells fishingcard for sports fishing. You are allowed to fish wherever you want in the part of Vansjø which refers to Hananbukten bay and the area between Krapfoss and Nesparken. Watch more photos on Facebook page Moss Norway Travel Guide.